Hail is a form of frozen precipitation that's created by strong thunderstorms with fast updrafts — air being pulled upward into a thunderstorm. It can cause serious damage, especially to cars, aircraft, glass-roofed structures and most notably, farmers' crops. Hail causes approximately $1 billion in property and crop damage each year. The costliest hailstorm happened in April 2001, from eastern Kansas to southwest Illinois, including the St. Louis area. Property damage in this storm exceeded $2.4 billion in 2010 dollars. Deaths from hail are rare — the last known death caused by hail in the U.S. was in the year 2000, when a man was killed by softball size hail in Fort Worth, Texas. Hail is formed when very strong thunderstorm updrafts meet supercooled water droplets. Supercooled water droplets are liquid water drops that are surrounded by air that is below freezing, and they're a common occurrence in thunderstorms. There are two methods of hail stone formation and growth that give hail stones their "layered" look. A tiny ice crystal will be the nucleus of the hail stone. In wet growth, supercooled water droplets collide with and spreads across the ice nucleus. Since this process is relatively slow (slower than the dry growth process) it results in a layer of clear ice. Unlike wet growth, the supercooled water meets the ice nucleus and immediately freezes. Because this process is so fast, everything within the supercooled droplet, including small air bubbles, freezes into the layer, which gives it a cloudy look. Rain and hail is what creates the "bounded" portion of the bounded weak echo region (BWER) on radar. 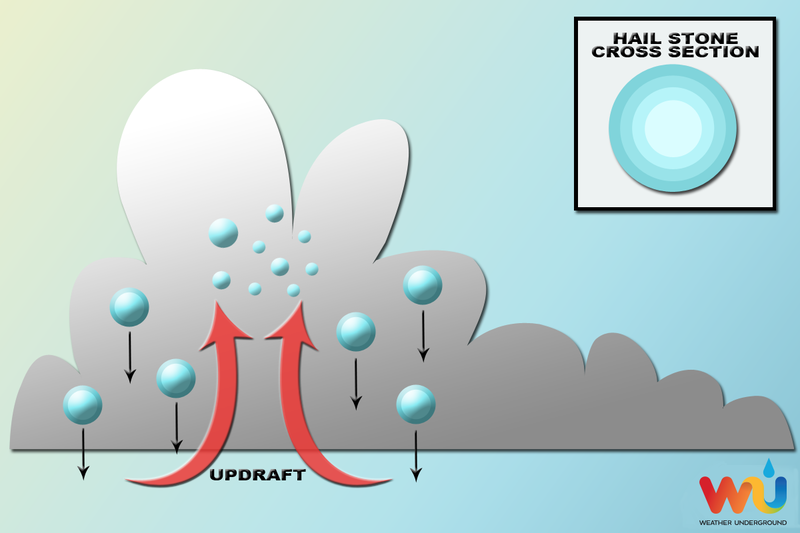 The weak echo region is created by a strong updraft, which also helps the hail to grow. 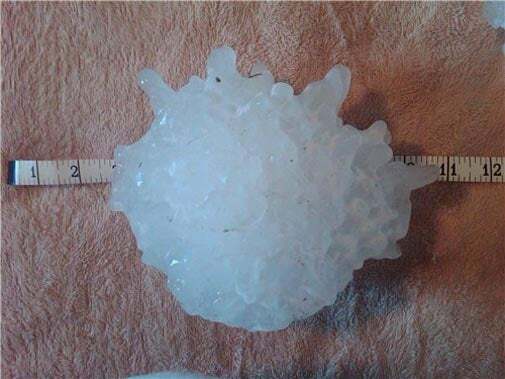 The largest officially recognized hailstone on record to have been "captured" in the U.S. was that which fell near Vivian, South Dakota in 2010. It measured 8.0 inches in diameter, 18.5 inches in circumference, and weighed in at 1.9375 pounds. Mr. Lee Scott, who collected the monster stone, originally planned to make daiquiris out of the hailstone but fortunately thought better and placed it in a freezer before turning it over to the National Weather Service for certification. More on record-setting hail from our Weather Historian, Christopher C. Burt. The largest hail stone on record in the U.S. was an eight-inch monster that fell on July 23, 2010 in Vivian, South Dakota.